We are very happy with the support of the DJ’s and Trancefamily for our first official remix. Stefan Viljoen ft. Jade Mc Donald – Divinity (Spark & Shade remix) is played by Armin van Buuren, Mike Koglin, Judge Jules, Tempo Giusto and more. 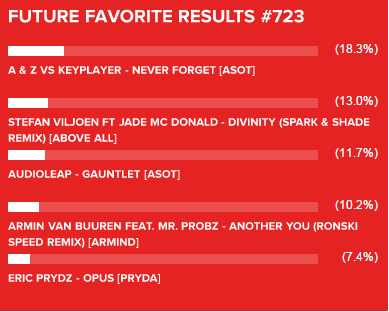 Besides the support from Armin van Buuren, our remix became second in the voting for the #ASOT723 Future Favourite. Though it didn’t won, our remix is played again in ASOT 725, which was a live recording of Armin van Buuren’s set at Ushuaia!